The opening fanfare was impressively crisp, with a chilling answer in the minor, from the horns. Under the inaugural baton of Milan as director, the ensemble was lead safely at a steady tempo, allowing the solos to shine. We were treated to an illustrious trumpet, a beautifully lyrical clarinet, and a euphonium that could run surprisingly effortlessly for such a large instrument. 1. Within the first minute of his entry, Bailey demonstrated masterful sensitivity, snatching a moment of silence from the orchestra for an alluring, pianissimo little phrase, and returning to full volume as the orchestra rejoined him. The high standard for the rest of the work was set – and I for one, was not once disappointed. Dvorak’s soaring melodies were sung with a wonderfully fluid right hand, and somehow the semi quaver triplets were audible over the strong, glimmering orchestra. 2. Gueller skilfully merged the orchestra into the cello, with the control of balance that one would expect in a recording studio. His tantalising timing is heart-stopping – he and Baily literally had us on a string. Baily clearly loves his job. At times he seems to play for the pure enjoyment of it, and at other times he was definitely serenading us. The oboe duet was sublime. Trombones did well with a tricky entry, and the movement finished with all the tranquillity of a mirror lake in the mountains. 3. Baily executed Dvorak’s mind-bending requirements technically and passionately. His phrasing of demi-semiquavers were musical sentences that made perfect sense. Seamlessly, Suzanne Martens’ violin solo continued the quality of delivery, so that one only noticed the change of performer by the change of register. Gueller coaxed a gladdening lullaby from muted brass in the unusually peaceful 3rd movement that, never the less, thundered to a rousing, exhilarating close. Some of us leapt to our feet, others rose after a few claps, and few were left sitting. Upon returning for their second bow, an amusing mime of “After you, gentle sir.”, “No please, I insist, after you.”, “Quite the contrary my dear fellow, it is I who insist.”… ensued. I was impressed by Baily’s grace, delaying his acceptance until all the soloists, and the full orchestra, were acknowledged. 1. Without the focal point of a soloist to absorb praise and criticism, the orchestra emerged spotless. Entries were concise, runs were isochronic, and technique was of a high standard. Gueller’s exciting and dramatic style invigorated a movement that can, by some conductors, become plodding. He is an artist – painting a sound scape of surprising crescendos, secret diminuendos, and sweeping decorum. 2. The horns made a clean, well spoken opening, joined by serene, articulate winds. Gueller’s phrasing was light and sensual, while giving full expression to the majestic rhythm of the composition. Personally, I prefer his unwavering tempo and use of dynamics that create excitement, to other conducting styles that vary the tempo for excitement. 3. The immaculate opening was synchronous. Gueller enjoyed the playfully running strings, animatedly weaving interruptions of violas by cellos, and cellos by violins. Brahms requires his beloved brass to be the gleam in his sound, and gleam they did, with precision and burnish. 4. I find Brahms quite a complicated composer. If I follow all his trains of musical thought, I can only stand in wonder at the complexity of it. His fugal melodies multiply as if they are describing architecture. To hold on is like trying to hold an octopus that keeps growing more legs. Gueller handles this well. He seems to know where all the leads are going, not because he knows the score, but because he can see how it should all fit together. His sound is a successful combination of metronomic tempo and individual interpretation. I would say he lets the work speak for itself – if I could not imaging the level of skill that is required to bring an orchestra to play this work in such a way that the complexity makes sense. The flute solo was a show stealer – heart-flutteringly beautiful, with expert use of the full register. Trombones and horns maintained good control over difficult, low volume terrain. Throughout the evening, I frequently felt I was listening to a top orchestra, and I was reminded of how wonderful it is that our orchestra is able to perform the great works, as we love to hear them. 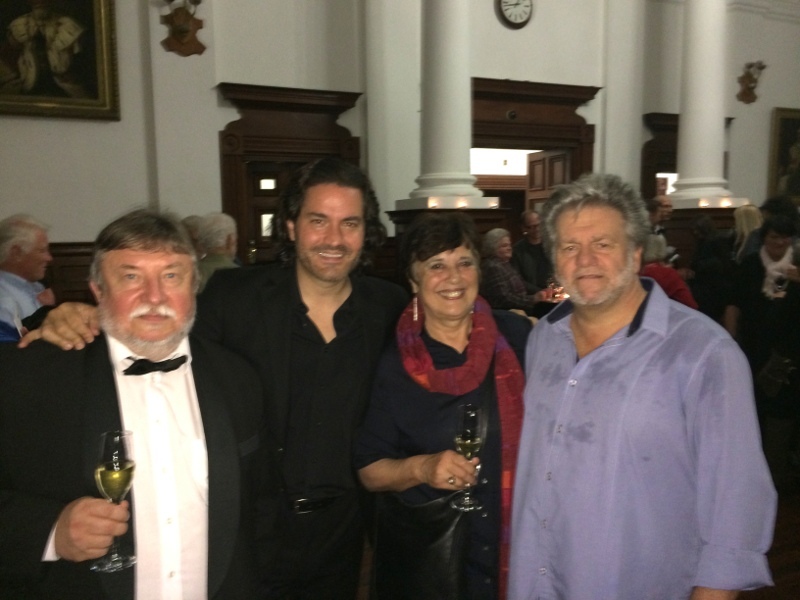 This entry was posted in Classical Music Review, Concert Review and tagged Andy Wilding, cape town events, cape town philharmonic orchestra, cape town philharmonic orchestra concerts. Bookmark the permalink.